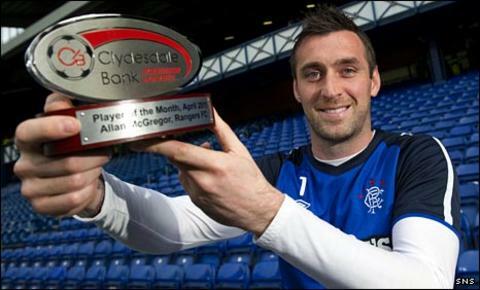 Allan McGregor has been named player of the month in the Scottish Premier League after helping Rangers to the brink of the title. The 29-year-old goalkeeper received his Clydesdale Bank award after the reigning champions recorded six wins, one draw and a defeat during April. Scotland international McGregor had five clean sheets during the month. The most high-profile was in a 0-0 draw with title rivals Celtic that included a save from a Georgios Samaras penalty. McGregor started the month by conceding three goals in a disappointing 3-2 home defeat by Dundee United. But he finished April with three clean sheets in a row - St Mirren were the only other team to score against him - and has followed that with two more during May. The latest came in Tuesday's 2-0 win over United, a result that puts Rangers four points clear at the top of the table. Celtic must now avoid defeat away to Hearts on Wednesday to force the title race into a final-day climax on Sunday.